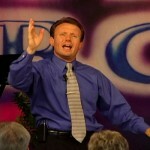 Pastor Steve Foss had an angelic encounter at 2am one morning in October of 2008 and he received a divine call of God to start Zadok International Church. (Previously called The Upper Room.) With many supernatural confirmations that followed, Pastors Steve and Carrie Foss began to prepare for an Easter launch. They only knew a handful of people; definitely not enough to start a church, but despite that they knew they had heard from God. With no guarantees, and a deep faith in the word God had spoken, they stepped out and opened the doors of the Upper Room on April 12th, 2009. The Zadok experienced amazing growth, and by Dec. 2009 was running over 250 people. The Upper Room started in a small sanctuary that seated 100 and within 4 months expanded to seat 250, adding children’s classes and nursery. Then by the 1 year anniversary, we had to expand for a second time to a new sanctuary seating over 400, and add a Saturday night services. Throughout our second year the spiritual and numerical growth continued and we expanded the sanctuary for a third time in February, 2011, so that we can now seat over 550. The church now has over 900 members spread over three weekend services. Zadok International Church is one of the fastest growing churches in the Dallas/Fort Worth metroplex. As exciting as the numbers are, the real testimony to the work of God is the hundreds of testimonies of changed lives. By the working of the Holy Spirit, God is using Zadok International Church make a real difference in the lives of hundreds of people, and redefine the rules for building a significant church. We also are having worldwide impact with over 800 churches under our spiritual covering, as well as ten’s of thousands every year completing our Armed for War discipleship course. In addition, through the 20000souls.com Campaign, we are seeing dozens of churches come together to reach the lost, and disciple the new converts. On February 15, 2012, Zadok International also launched it’s first House of Prayer, opening it’s sanctuary during normal office hours to the public as a place of intercession and worship, creating a sanctuary for the presence of God the continually dwell. Zadok International Church has been seeing an awesome move of the spirit; a move that has changed many lives and brought healing to many wounded souls. We have seen amazing things but we know that this is only the beginning. God is preparing us for something more than just building a church, God is waiting and longing for someone to break open the spiritual atmosphere over Dallas/Fort Worth and re-dig the wells of revival! It is our vision and our unending goal to see the name of Jesus exalted and His kingdom established here in the Earth!